The 2018 midterm elections are a tight referendum on an unpopular president with the GOP running the risk of suffering massive defeats similar to what happened to the Democratic Party in 2010. Absent major policy achievements under unified government of the past two years, Republicans have largely eschewed messaging about unpopular policy accomplishments like the tax cut bill and efforts to repeal the Affordable Care Act in lieu of appealing to white grievance and other other culture war topics. The intuition is these appeals will resonate more with base GOP voters and motivate them to come to the polls on Nov. 6 in some decisive House races that could decide control of the lower chamber for the next two years. I leverage the effect these appeals are having in seven congressional districts whose races are being tracked by the 2018 New York Times/Siena College live polls for The Upshot. The primary importance of these polls is to track aggregate opinion as it may manifest in support for the GOP candidate or the Democrat in the race, but the microdata The Upshot makes available has several interesting questions that touch on some of these topics, even if these questions on topics like Colin Kaepernick’s protests do not reliably appear in all surveys. I select one interesting question that appeared in seven polls: whether the respondent believes discrimination against whites has become as big a problem as discrimination against blacks and explore the effect this has on support for the GOP congressional candidate in seven House races: CA-48, IL-06, IL-12, KY-06, MN-03, MN-08, and WV-03. These polls are not exhaustive of all possible covariates, given their narrow interest in tracking aggregate vote intentions. Thus, the additional covariates in the model are minimal and included contingent on availability across all seven polls. I include other covariates for whether the respondent is 50 years old or above, a woman, college educated, or if the respondent has struggled with or knew someone who struggled with opioid abuse. These covariates are in addition to the binary indicator of whether the respondent believes discrimination against whites is as big a problem as discrimination against blacks. The dependent variable is a binary measure of support for the GOP candidate for Congress over the Democrat; those who are undecided are treated as missing and are excluded from the analysis. The data have clear spatial clustering, with the most obvious component being the unique Congressional district race. Thus, I include random effects for Congressional districts, as well as party identification (Democrat, Republican, pure independents, supporters of other parties) and race-ethnicity (white, black, Asian, Hispanic, other) and allow the effect of the white discrimination to vary by Congressional district and party identification in the two models I estimate and show below. Few covariates in these two models are precise and have effects easily discernible from zero, which follow the limited number of observations (n = 2,835) that The Upshot polls have across these seven races and the conservative nature of the statistical model. Nonetheless, they indicate that the college educated are less likely to support the GOP candidate in these seven congressional candidates, even if the confidence intervals around the coefficient are diffuse with the limited number of observations and the amount of clustering that I model. There are similar negative, if diffuse, effects for women and knowing someone who has struggled with opioid abuse. Both decrease support for the GOP candidate and increase support for Democratic candidate. However, the most precise effect is clearly the belief in discrimination against whites as a problem on par with discrimination against blacks. This variable has the largest absolute effect and is clearly the most precise effect in the model. I next show the effect of the belief in discrimination against whites with simulations drawn from the models I estimate. I create rows for hypothetical respondents who are 1) younger than 50 years old, 2) men, 3) do not know someone who has struggled with opioids, and 4) who does not have a four-year college degree. 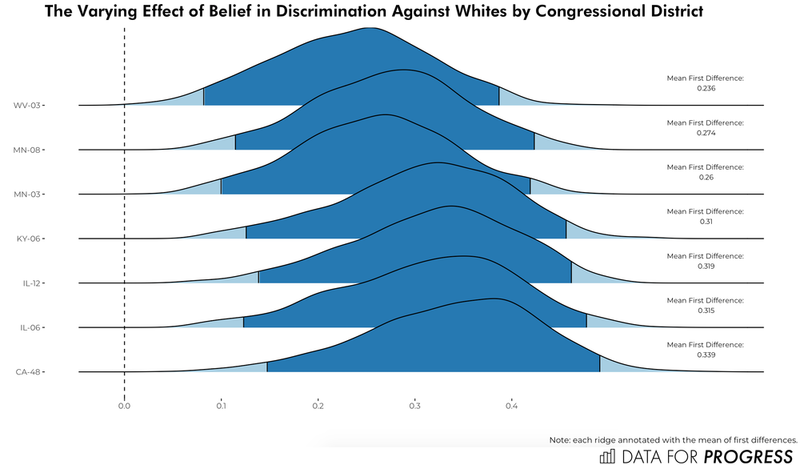 Then, I allow the effect of belief in discrimination against whites to vary from 0 to 1 for these hypothetical respondents 1) across all seven Congressional districts and then 2) by party identification. I conduct 1,000 simulations of first differences in the probability of supporting the GOP candidate for Congress and report them below as ridgeline plots of the distribution of first differences, starting with the varying effect by Congressional district. These simulations show the effect of believing whites are the subject of discrimination are diffuse across all districts. The first differences are always positive, indicating there was no simulation in which the hypothetical respondent who believed in discrimination against whites was less likely to support the GOP candidate for Congress than the respondent who did not believe in discrimination against whites as on par with discrimination against blacks. The diffuse nature of these simulations preclude more definitive statements of variation by Congressional district, though it’s worth highlighting the estimate effect of belief in discrimination against whites is highest in CA-48, where Dana Rohrabacher is running for re-election against Harley Rouda in a district Clinton won by 1.7 points, and lowest in WV-03, where Richard N. Ojeda is running against Carol Miller in a district Trump won by 50 points. The effect of believing in white discrimination has more interesting effects across partisan identification. Generally, the effect is lowest among Republicans. One interpretation of this, even comparing the Republicans to the Democrats, would emphasize the results from an analysis I conducted of the 2016 CCES data. My results suggested the least racist respondents with the strongest affinity for the GOP still voted for Trump whereas the most racist respondents with the strongest affinity for the Democratic Party started to break for Trump. Thus, racial attitudes have asymmetric effects by partisanship and it should be unsurprising that, two years later, the effect of an attitude in orbit of the affective/cognitive racism measures in the CCES are having the same muted effects on Republicans who are still likely to vote for Republican candidates no matter their attitudes on race. If the intuition is the GOP’s racial/cultural messaging are supposed to drive Republican voters to the polls, the data suggest they may be resonating more with those who do not identify as Republicans. The effect of believing in discrimination against whites is clearly stronger on pure independents and supporters of other parties than it is on Republicans or Democrats. There are caveats, of course. These seven Congressional districts are competitive, but not representative of all Congressional races (even competitive ones), and those who describe themselves as independent often conceal partisan affinities, but the data here suggest appeals to white grievance may be courting independents more than mobilizing self-identified Republicans, per se. Steven V. Miller(@stevenvmiller) is an assistant professor of political science at Clemson University. Code for replication is available on his Github: https://github.com/svmiller/dfp-white-discrimination.